GeoGames will be the first international geosynthetics welding competition. Twelve teams of 2 to 3 IAGI certified technicians (CWTs) will be selected to compete in this exciting new historic competition. Twelve liner installation companies from around the world will have a shot at representing their colors and at winning the first title and trophy for ‘’Best International Geosynthetics Installation Company’’! Complete information about the actual competition events has not yet been released but we can confirm that all main geosynthetics installation tasks, including wedge welding and extrusion welding, will be featured. The competition site will have risers, tents, announcers, judges, TVs, food, beverages, music and many surprises! GeoGames was born at the last Geosynthetics Convention in Orlando, in 2017 when Phil Denis and Vincent Mondoux (Project Managers for FC Liners) shared an end-of-convention dinner with their friends Laurie Honnigford (IAGI Managing Director) and ‘’Demo’’ Dave McLaury (IAGI Director), amongst a few others. Dinner talk included a discussion of fresh new ideas and concepts for the future of IAGI. Sometime between the soup and the salad, Phil and Vince shared their vision of a Geosynthetics Competition in the near future where installation companies from around the world could compete for a title. The idea caught like wildfire and the rest of the meal was spent brainstorming for GeoGames. Soon after, Laurie and Dave pitched the idea to the IAGI board of directors and it stuck: an organizing committee was quickly put in place. 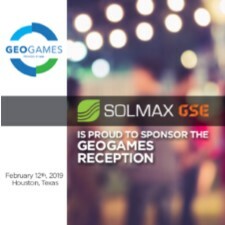 Don’t miss the first iteration of GeoGames at the Geosynthetics 2019 convention in Houston, TX!